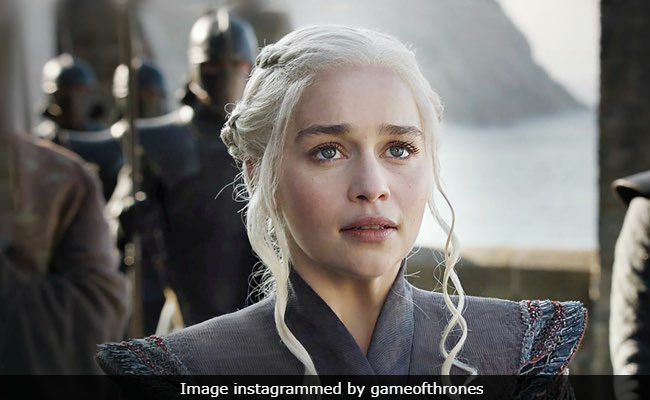 Emilia Clarke said that Game Of Thrones has been her "home away from home for almost a decade"
Actress Emilia Clarke bid adieu to popular drama series Game Of Thrones in an emotional Instagram post. Wait... it doesn't necessarily mean the end of her character Daenerys Targaryen. Emilia may have just completed filming the eighth and final season of the show and there's post-production work, including special effects, left before the new season airs in 2019. The Internet had a "panic attack" of sorts after reading Emilia's post, which doesn't reveal the fate of her character. A terrified Instagram user commented: "What?!?!? Does that mean they've finished filming or she dies!?!?" Most of the Instagram users voted for latter. In her Instagram post, Emilia wrote: "Hopped on a boat to an island to say goodbye to the land that has been my home away from home for almost a decade. It's been a trip Game Of Thrones thank you for the life I never dreamed I'd be able to live and the family I'll never stop missing." Emilia's character Daenerys Targaryen, also known as Khaleesi and the Mother of Dragons, is one of the top contenders of the Iron Throne, which is currently occupied by Cersei Lannister, played by Lena Headey. In season 7 finale, on the one hand the Army of the Dead lead by The Night King atop undead dragon Viserion crumbles the Wall and on the other hand through Bran's vision viewers get to know that Jon Snow is a Targaryen and the true successor of the Iron Throne while Jon and Daenerys begin their romantic relationship. Game Of Thrones season 8 went on floors in October last year and the season will premiere in early 2019. The final season will have six episodes and it will be directed by David Nutter, Miguel Sapochnik and writer duo David Benioff and DB Weiss.